Picking up where I left off in sharing our Regional Thankgiving celebration with friends, I also highlighted food inspired by the southwest. This dish was one I found online and really liked how it used cauliflower. Guests at my party raved about this dish so I know this particular recipe is one many are waiting for. A twist on the usual cheddar cheese, this recipe calls for a Mexican grating cheese, queso cotija. You can find it at any latin/spanish market. If you can't find it, another alternative is using quesadilla cheese or even queso fresco, a Mexican crumbling cheese. The recipe says to layer the ingrediens in a baking dish but you can also just combine the cauliflower, seasoned cream and peppers in a bowl then place in a dish, topped with the cheese before baking. Either way, it's delicious and it was very easy to prepare, even days in advance! 2 Days Before: Roast the poblano peppers, peel, seed and cut into strips. Cut up cauliflower to prep for boiling. 1 Day Before: Boil cauliflower florets, drain and cool. Assemble dish, cover and chill. Day Of: Bake in oven and serve. 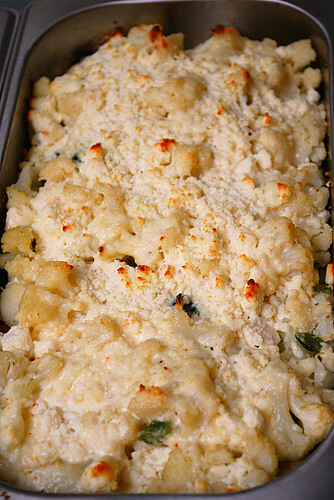 Bake in a 450° oven until cheese is browned and cauliflower is tender when pierced, about 30 minutes. Let stand 10 to 15 minutes before serving. 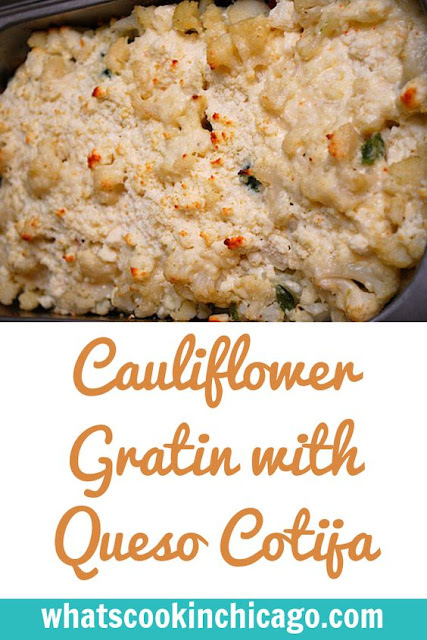 I love cauliflower gratin - and I'll bet the addition of poblano chiles really kicks this up! What a fantastic idea.